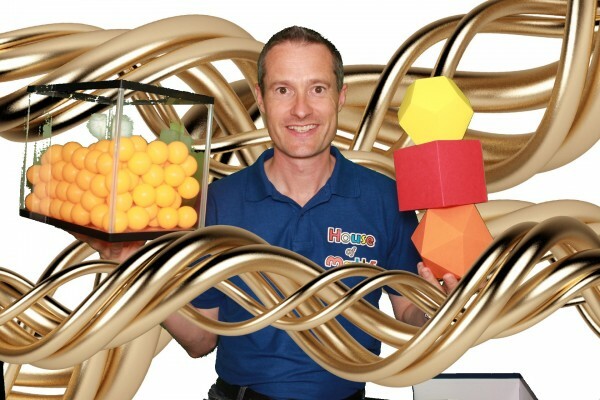 Barney is proud to present the House Of Maths – unique in-school visits from Years Reception to 8, crammed full of maths and fun enough to be talked about for weeks afterwards. With a choice of maths shows, maths workshops or a combination of the two, Barney can visit your entire Primary School, Middle School, First School or Lower Secondary School in one day – or choose a two-day visit if you prefer. 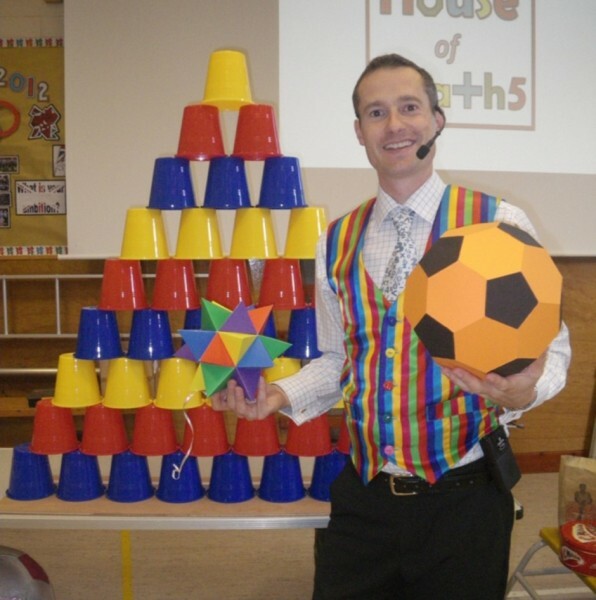 So contact House Of Maths now to arrange your Primary or Lower Secondary School / Key Stage 3 Maths Day, and let Barney Maunder-Taylor take charge, placing maths centre stage and making number, shape, pattern and measurement relevant, fun and exciting! House Of Maths Shows are best for groups of 50 to 180 students at a time (for smaller groups you may prefer a maths workshop ) with separate shows for e.g. Years R,1&2, Years 3&4, Years 5&6 and Years 7&8. Each maths show for schools typically lasts from 30 to 60 minutes – you decide – all with A-V display (see FAQ for details), incredible custom props, and plenty of audience involvement. Perfect for Preschool, KS1, KS2 and KS3. Covering number, shape, pattern and all aspects of maths. Barney Maunder-Taylor is unique amongst Maths Workshops presenters: he has a double first in maths from Oxford University, is a former Champion of Countdown (series 62), is a previous winner of Bournemouth & Poole Children’s Entertainer Of The Year (Dorset), and still holds the title of Jester of Bournemouth. A former cabaret juggler, Barney now divides his time equally between tutoring maths to University level in Dorset, and presenting maths shows & assemblies and maths workshops in Primary and Lower Secondary schools throughout Dorset, Hampshire, Wiltshire, Berkshire and the South. As a teacher of maths Barney is clear, dynamic, innovative and entertaining; as a maths demonstrator and schools visitor Barney delights in sharing his passion, tricks and insights into the hidden maths of our everyday lives. House Of Maths Workshops for Primary and Lower Secondary Schools are best for one class size of up to 32 students at a time, with separate interactive maths workshops for school classes Reception to Year 8. These are totally hands-on maths workshops where every student does the maths themselves – so ideal for smaller schools or for two-day visits to larger schools. (If you are a large Primary school you may prefer a day of maths shows). 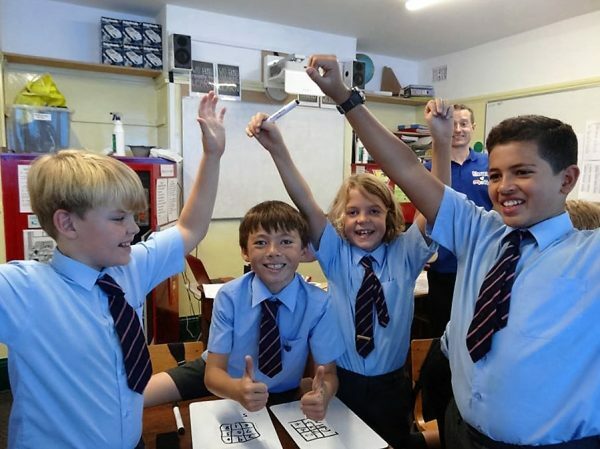 House Of Maths workshops cover Preschool, KS1, KS2 & KS3 in schools in Bournemouth and Poole, and all schools in Dorset, Hampshire, Wiltshire and surrounding counties across the South.